Menards is the third largest home improvement retailer in the U.S. with estimated annual sales at $8+ billion and over 270 retail stores. If you are not selling to Menards, this is your opportunity to meet with them! The event will take place at the Menards corporate headquarters in Eau Claire, Wisconsin. Product/samples can be shipped to Menards ahead of the meeting for set-up on 24 April. 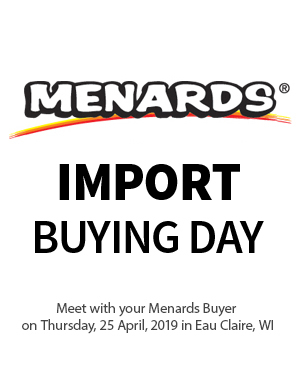 A short Menards presentation and a local Menards store group visit is included on the afternoon of 24 April (transportation is not included). Our cancellation deadline for this event will be 24 March, 2019. No refunds are possible after 24 March, 2019. If you are a non-U.S. company and NOT SELLING to Menards, or want to present something NOT PREVIOUSLY presented to Menards, THIS IS YOUR OPPORTUNITY to meet with them!